This classic trick exhaust whistle prank has been around for generations, but it still works today. You simply place the trick exhaust whistle on the exhaust pipe of someone's car. When they drive down the road the tip causes the car to whistle while they are pressing on the gas pedal. The whistle becomes so annoying after a few minutes, but the poor sucker has no idea where it is coming from! 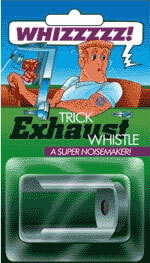 CLICK HERE TO SEE A VIDEO OF THE TRICK EXHAUST WHISTLE! "I put my trick exhaust whistle on my mom's Honda and she pulled over freaking out!" "I want to thank the trick exhaust whistle for the sweet revenge I got on my ex girlfriend. YES!!!" "The trick exhaust whistle sounded awesome on my friend's Honda Accord! I love it!!!" TRICK EXHAUST WHISTLE WORKS ON ALL CARS!